A reflection for the Solemnity of the Most Holy Trinity, Year A. The readings are Exodus 34:4b-6, 8-9; Daniel 3:52, 53, 54, 55; 2 Corinthians 13:11-13 and John 3:16-18. Today we celebrate the Solemnity of the Most Holy Trinity and of course I am thinking of the number three. 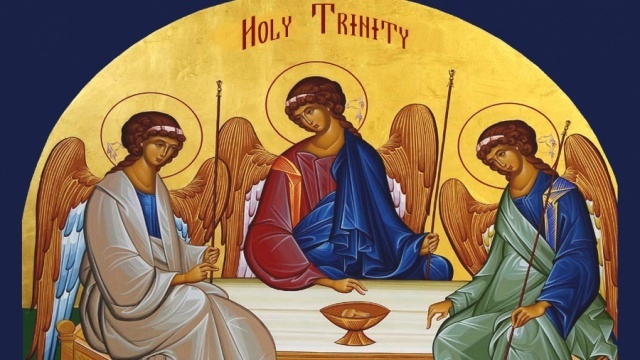 Trinity means three and it refers to the mystery of our Faith that even though God is one God, God is also three persons: Father, Son and Holy Spirit. And so I am thinking of the number three. Along with the numbers seven, twelve and forty, three is an important biblical number. I looked it up and found out that the number three appears in the Bible some 467 times! God creates the world in three days. Well, no. I am just making sure you’re not just skimming through this. God creates the world in 6 days, which is 3+3. And check this out: Jesus is crucified at the 3rd hour (which is 9am; Mark 15:25) and he dies at the 9th hour, which is 3pm (Matthew 27:45-50). And my most favourite one: There are 27 books in the New Testament: That’s 3x3x3. Perfection to the third power! Three is a number that signifies completion. That’s why every good story has a beginning, middle and end. So three is important. It’s also important in other religions. I recently found out that in Hinduism there are three principal gods: Brahma, Vishnu and Shiva. In Islam, they also venerate in three: Allah, Allah’s prophet and Allah’s creation. And our God – the God of the universe is one God, but three persons. But we have to be careful with that. God is one God, three persons. It’s not three gods like in Hinduism. It’s not three aspects of God, or three qualities of God. It’s not three sides or phases of God – that’s why the shamrock is not a great example of the Trinity; it’s not three forms of God – which is why water, as ice, liquid and gas, is also not a great illustration of God. God is ONE God; three persons. Each person is fully distinct from the other, but at the same time, fully and completely God. Each person, at the same time is fully united to the other and in their union they are completely God. One God; three persons. And while it is not explicit in Scripture, we do find hints of it. The first perhaps is the fact that in the first creation story in the book of Genesis, God refers to himself in the plural. Then we have God presenting himself to Abraham and Sarah as three people. In Isaiah and in the Book of Revelation we hear that God is three-times Holy. And then at the end of the Gospel of Matthew, Jesus tells the disciples to baptise in the name of the Father, the Son and the Holy Spirit. In today’s second reading, we hear that St. Paul ends his second letter to the Corinthians by wishing that “the Grace of our Lord Jesus Christ, the love of God and the fellowship of the Holy Spirit” be with them. So, this concept of God, the Father, the Son and the Holy Spirit was already there at the time of the Apostles. May be hard to understand completely, but not impossible to understand in part. We can understand it in part because God is love. In the first reading Moses tells us that God is gracious, merciful, slow to anger and rich in kindness and fidelity. Those are qualities of God. Those are things God does. In the Gospel, Jesus tells Nicodemus that God loved the world so much, that He gave His only Son. Again, that is something God does. But God does these things, because God is love. Simple. God is love. That’s not a quality of God or something God does. It’s who God is. God is love. If God is love, then God has to be a relationship. You can’t be love in solitude or in isolation. If God is love, it makes sense that God is a relationship; a community of persons; Father, Son and Holy Spirit. God is a living, dynamic, loving, relationship, community of love between three persons who continually and eternally are outpouring of themselves into each other and receiving the total outpouring of each other into themselves. God is a relationship of love: lover, beloved and the love that they share: Father, Son and Holy Spirit. It’s easy to understand because we know love; because we experience love and relationships. And that’s what we celebrate today. God is love. And we are created into that love. We are invited into that love. We are called to be the image of God, who is love – to love and to be in relationship with God and with each other. That’s Communion. That’s what we are reminded of at every Eucharist. It’s not just me and God but it’s also me and you: God, me and you. ‘Cause all good things come in threes. It’s definitely all about love and relationship! In Hinduism, there is only one supreme God. The gods we hear about are avatars of the one God, Brahman.